UNIVERSITY PARK, PA. — The one thing that Appalachian State needed from redshirt sophomore quarterback Zac Thomas in his first college start was a performance close to error free in the crucible of 105,232 fans Saturday at Penn State’s Beaver Stadium. Thomas accomplished his Herculean task with flying colors until an interception by cornerback Amani Oruwariye on a contested pass in the end zone lifted the 10th-ranked Nittany Lions to their 45-38 overtime victory. Replacing four-year starter Taylor Lamb, Thomas completed 25-of-38 passes for 270 yards and fired a pair of fourth-quarter touchdown aerials to Malik Williams as he rallied the Mountaineers from 14 points behind in the final eight minutes of regulation. He also rushed 15 times for 43 yards and one more score, while only taking two sacks. The Thomas-led offense rolled up a 451-434 advantage in total yardage. The Mountaineer special teams outgained Penn State 141-81. 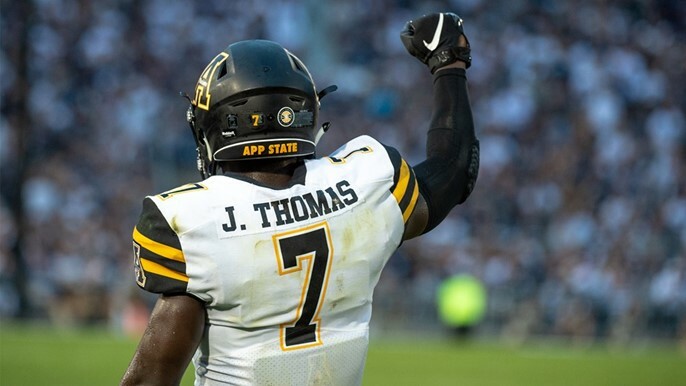 Thomas turned in a performance that had the Mountaineers a play away several times from their most stunning upset in 11 years. On the 11th anniversary of ASU’s 34-32 victory over Michigan — considered by many to be the greatest upset in college football history — Appalachian came painfully to claiming another win against a Power-5 conference and top-10-ranked opponent. The Mountaineer offense came alive for 28 points in the fourth period and Thomas maneuvered them into position for Chandler Staton’s 56-yard field goal attempt with 20 seconds remaining as App State faced fourth and four from the Penn State 39. Staton, kicking at the edge of his range, hit the ball cleanly and powerfully enough to get it to the crossbar before it veered inches wide to the right. Instead of a stunning victory, the Mountaineers were forced into overtime. The raucous Penn State crowd held its breath as the well-struck kick tumbled towards the goal posts. Miles Sanders (15 carries, 91 yards, two TDs rushing) jaunted four yards to give the Nittany Lions the lead again in overtime before Oruwariye timed his break perfectly on Thomas’ high-arcing pass to the end zone and out-fought receiver Corey Sutton for ball. The mood among the Mountaineers was bitter disappointment, but also tremendous optimism as they proved they could compete against one of college football’s most elite teams. It was a game played at an incredibly high level for a season opener. It was physically grueling, emotionally draining for everyone who participated, or watched, and had fans on the edges of their seats, whether watching in Happy Valley, or viewing the nationally-televised contest on the Big Ten Network. It was an encounter filled with momentum swings and well-executed plays. After Penn State scored on its first drive of the game — a march fueled by two controversial penalties calls against the Mountaineers before Nittany Lion quarterback and Heisman Trophy hopeful Trace McSorley (21-of-36, 230 yards passing) dashed 12 yards for the TD — ASU kick returner Darrynton Evans invoked memories of Dexter Jackson at Michigan. Playing for the first time since his game-changing, 94-yard, kickoff-return touchdown helped the Mountaineers turn the tide in the 2016 Camellia Bowl win over Toledo, Evans burst the Penn State coverage unit and zipped 100 yards for the TD that tied the score in the first period. Just as Michigan had learned, Penn State discovered that this was an App State squad that could match, or exceed its speed. The two teams traded field goals in the remainder of the first half to leave the contest tied at 10 as they departed for the locker rooms after some outstanding play by both defenses. The Nittany Lions exerted their dominance for most of the third period, with two long and efficient scoring drives giving them a 24-10 lead. Just when the noisy students in the south end of the stadium began to relax, Thomas and the Mountaineers turned the Penn State secondary into mincemeat. A 21-yard strike from Thomas to Williams — two plays after Thomas had the wind knocked out of him on a vicious hit by PSU’s Lamont Wade at the end of a 15-yard run — cut the lead to 24-17. While Thomas was being evaluated on the sideline, third-string quarterback Peyton Derrick made some magic in his first game action ever on fourth and two when he lofted a perfect pass for 22 yards to Dominique Heath to keep the drive alive. Penn State answered with a score of its own, but Appalachian responded as Thomas and Williams (four catches, 65 yards) connected again for another touchdown. Still down by seven points with only 7:40 remaining, Satterfield made one of his few gambles. He called for Michael Rubino to try an onside kick. Rubino recovered the perfectly-executed effort himself and the Mountaineers had an important possession and the chance to rest its defense. Three plays later, Sutton dashed behind the secondary and hauled a Thomas aerial in at the Penn State one for 39 yards to set up Thomas for the game-tying, touchdown burst to pull the Mountaineers even at 31. The Nittany Lions went three and out on consecutive drives as safeties Desmond Franklin and Josh Thomas forced McSorley into incompletions on well-timed blitzes. Anyone remember Pierre Banks smacking around Chad Henne at Michigan? Another important play was freshman Clayton Howell booming his 53-yard punt that died like a well-placed pitching wedge at the Penn State four to give Appalachian an important field-position advantage. Starting their next possession at the Penn State 42, the Mountaineers quickly struck again. Jalen Moore was a workhorse as ASU tried to milk some clock and the senior tailback broke tackles and skirted to the sideline on his 16-yard scoring scamper to give Appalachian its 38-31 advantage with 1:47 on the fourth-quarter clock. One of the biggest Penn State mistakes of the contest remarkably turned out golden and saved the game for the Nittany Lions. An indecisive KJ Hamler hesitated on a deep Rubino kickoff several yards deep in the end zone before bringing the ball out. When the Mountaineers missed a tackle that would have pinned PSU deep again, Hamler turned his fortune into 52 yards as the Nittany Lions took over at the App State 48. McSorley rapidly completed 5-of-6 passes, including his 15-yard strike to Hamler to knot the score again with 42 seconds left. But another hook-up between Thomas and Sutton for 30 yards moved the Mountaineers close to field goal range and Moore got them closer with his six-yard running blast. On fourth and four, Satterfield decided for the field goal attempt that sailed inches wide. Appalachian won the toss in overtime and decided to defend first and Penn State running back Miles Sanders needed only four plays to smash into the end zone, his final run coming from four yards out. Thomas’ lone interception could have easily been his third touchdown pass as Sutton got two hands on it before Oruwariye snatched it and the game away.